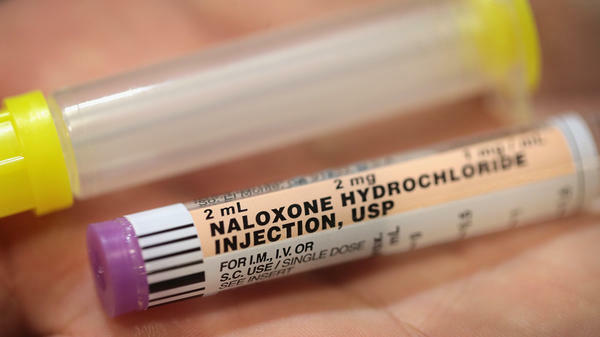 Some medical professionals say declaring a national emergency could make Naloxone, a drug that treats opioid overdoses, more readily available. Some medical professionals and others who work to treat drug addiction are praising that recommendation, saying it would shore up much needed drugs to treat overdose and aid recovery. But others worry it could lead to heightened enforcement of those struggling with addiction — similar to the crack epidemic of the 1980s. The commission, chaired by New Jersey Gov. Chris Christie, has it right, says Dr. Andrew Kolodny, an addiction specialist with Brandeis University. "This is a public health emergency," he says, noting that since 1999, more than 300,000 Americans have died from opioid overdoses. Drug overdoses now kill more people each year than gun homicides and car crashes combined. In its report, the commission says by declaring a national emergency, the president and Health and Human Services Secretary Tom Price could take immediate action on a number of fronts. They could grant Medicaid waivers to states to expand funding for inpatient drug treatment. With emergency powers, the commission says the HHS secretary could negotiate lower prices for naloxone, a drug that reverses overdoses. Kolodny says that would allow state and local authorities to make the drug widely available. "There should be naloxone available in the Starbucks, because we have people overdosing in the bathrooms of Starbucks," he says. "Any place where people could be overdosing, naloxone should be available." But Grant Smith with the Drug Policy Alliance is uneasy about the tough language used by public officials in talking about drug abuse. He worries a "national emergency" could be a new version of the infamous "war on drugs" of years past. "During the crack epidemic of the 1980s, you saw excessive drug sentencing laws being passed in Congress," he says. "You saw communities of color being disproportionately impacted." Since becoming president, Trump and Attorney General Jeff Sessions have talked mostly about drug enforcement. In this interim report, the commission focuses mostly on expanding treatment options — including medication-assisted treatment, which uses the drugs methadone and buprenorphine to prevent relapses. The commission proposes using federal funds to expand the use of those drugs in recovery programs, a move that's praised by Dr. Corey Waller, an addiction specialist and member of the American Society of Addiction Medicine. "We have to get past this misperception that these [drugs] are a crutch ... or that these are just trading one addiction for another," he says, "because it's just not accurate and it maligns the reality that it significantly decreases the chances for someone's loved one to die." Overall, the commission is calling on the federal government to do more on the opioid crisis and to significantly expand funding through Medicare, Medicaid and other federal agencies. So far, there's been no reaction from the president or his HHS secretary to the commission's recommendations. This week, a presidential commission chaired by New Jersey Governor Chris Christie recommended that the president declare opioids a national emergency. Medical professionals and others who treat drug addiction are praising that idea. But there's still plenty of disagreement about just how to deal with the opioid crisis. NPR's Greg Allen reports. GREG ALLEN, BYLINE: Dr. Andrew Kolodny with the Opioid Policy Research Collaborative at Brandeis University's Heller School, says the president's commission has it right. ANDREW KOLODNY: This is a public health emergency. Since 1999, more than 300,00 Americans have died from an opioid overdose. ALLEN: Drug overdoses now kill more people each year than gun homicides and car crashes combined. In its report, the commission says, by declaring a national emergency, the president and Health and Human Services Secretary Tom Price could take immediate action on a number of fronts. They could grant Medicaid waivers to the states to expand funding for inpatient drug treatment. With emergency powers, the commission says, the HHS secretary could negotiate lower prices for naloxone, a drug that reverses overdoses. Kolodny says that would allow state and local authorities to make the drug widely available. KOLODNY: There should be naloxone in a Starbucks because we have people overdosing in the bathrooms of Starbucks. Any place where people could be overdosing, naloxone should be available. ALLEN: Grant Smith, with the Drug Policy Alliance, says while declaring a national emergency would free up resources quickly, he gets uneasy when he hears public officials use tough language to talk about drug abuse. He worries a national emergency could be similar to an earlier war on drugs. GRANT SMITH: During the crack epidemic in the 1980s, you saw excessive drug sentencing laws being passed in Congress. You saw communities of color being disproportionately impacted. ALLEN: Since becoming president, Trump and Attorney General Jeff Sessions have talked mostly about drug enforcement. In this interim report, the commission focuses mostly on expanding treatment options, including the use of methadone and buprenorphine to help those recovering from opioid addiction. The commission proposes using federal funds to expand use of those drugs in recovery programs, a move that's praised by Dr. Corey Waller with the American Society of Addiction Medicine. COREY WALLER: We have to get past this misperception that these are a crutch, or these are just trading one addiction for another because it's just not accurate. And it maligns the reality that it significantly decreases the chances for someone's loved one to die. ALLEN: Overall, the commission is calling on the federal government to do more on the opioid crisis and to significantly expand funding through Medicare, Medicaid and other federal agencies. So far, there's been no reaction from the president or his HHS secretary to the commission's recommendations. Greg Allen, NPR News. Transcript provided by NPR, Copyright NPR.